We all know the name of Neil Armstrong, the first man to walk on the Moon. 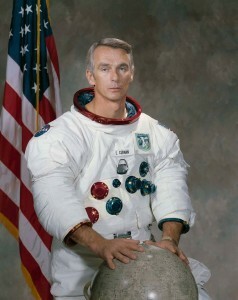 How many of us know that of Eugene Cernan? In December, 1972, he became the last human being to walk on the surface of Earth’s satellite, during the final Apollo mission (#17). His journey into – and back from – space came at the tail end of a period of enormous national energy and productivity, during which the United States undertook and accomplished many a daunting enterprise (plenty failed, as well). Retrenchment and introspection followed, and NASA changed tactics, focusing on near-Earth orbits, with the Space Shuttle program, rather than on trips into deeper space. Though Cernan knew when he left the Moon that no further visits were scheduled, he never imagined that over 43 years would go by without a single new attempt. The Last Man on the Moon, a powerfully engaging new documentary by filmmaker Mark Craig (known previously for portraits of race-car drivers, such as Jackie Stewart: The Flying Scot) tells Cernan’s fascinating story, from his days as a navy pilot to his historic role as astronaut. Perhaps, with the one-two punch of this film and Ridley Scott’s recent The Martian, we can deliver a knockout blow to the naysayers and jump-start our renascent dreams of interplanetary travel. The film – based on Cernan’s autobiographical book of the same title – is tinged with a strong nostalgia for an optimistic past that is hard to fathom from the perspective of today’s cynical age. The decade of the 1960s was a violent one, both domestically and internationally – see another current documentary, The Look of Silence, for just one example – in which America was riven by strife over civil rights and the Vietnam War, but, for a while, anyway, we came together over our hopes for what NASA could do. These aspirations were primarily motivated by competition with the Soviet Union, for sure, but then most human endeavors come out of some such drive to prove oneself. What The Last Man on the Moon makes clear is that a group of dedicated men (and their wives) somehow managed to pull off an amazing feat of physics and engineering that had seemed unfathomable just a few decades earlier. The Americans may have been the ones with moon-boots on the ground, but the achievement was shared by all humanity. Or so says Cernan; the Russians of that era might disagree. The movie is much more than a trip down memory lane, however. What makes it particularly effective, and affecting, is the time it takes to profile not only Cernan, but many of the other astronauts and NASA workers who made the space program possible. Craig and Cernan never let us forget the very steep human toll – people died, others divorced – that was a significant side effect of the obsessive drive to complete the missions. We meet Barbara Cernan Butler, ex-spouse of our protagonist, whose interview reveals how much the astronauts relied on their wives (and neglected them), without whom no home life would have been possible (Mr. Cernan is very cognizant of this, now); we meet Gene Kranz and Jim Lovell, the flight director and mission commander of Apollo 13 (profiled in the movie of the same title); we meet Cernan’s buddies and rivals, as well. All of them, together, contribute to a comprehensive portrait of the man, the space program and an important period in our history, the real-life version of the docudrama The Right Stuff. We also see stunning footage – some archival, some recreated – of the Earth and the Moon. Looking at the photographs of Cernan’s final moon-walks and moon-rover rides, one cannot but be struck by the awesome (and stark) beauty of the scene, and wonder how we could ever have abandoned a program that had come so far, so quickly. We had transformed the stuff of science fiction into reality. Imagine that! Since then, we dropped the ball, leaving it to private companies to develop their own rockets. Now that NASA is again thinking big, with possible trips to Mars in our future, perhaps the “last man on the Moon” can look ahead, knowing that he will not have been the last human to set foot on a celestial body beyond our atmosphere. Here’s hoping.